Since independence, there have been successive skirmishes in Africa, especially the Biafra war in Nigeria from 1967 to 1970, the sidelining of opponents to the regime of Sékou Touré in Guinea and the war of liberation in Guinea Bissau. Chad is not exempted from this. In fact, the political history of Chad from 1920 to 1990 is characterised by repeated violence, and coups d’état. Since the end of the seventies till the dawn of the 21st century, Chad has witnessed and still witnesses permanent instability. These various conflicts have led to great human loss and the displacement of hundreds of thousands refugees. Cameroon, which shares a border with Chad, is politically stable and acts as a host land for Chadian refugees. The acceptation or introduction of a new member into a society has always raised controversies. This is why the coming of Chadian refuges to the Faro Division has given birth to some changes whose effects are now visible. A question then comes to mind as to how the settlement of Chadian refugees in this area can be considered as an explicative variable of economic, socio-cultural and political dynamics in the division. 1Migration in central Africa is a field of studies that is still has to be researched. This domain can even be considered as marginal in the historiography of this region. Yet, wars and political skirmishes, which have plagued it since independence, have led to the displacement of populations. These populations move from town to town or from country to country for security's sake and in search of asylum or peaceful, stable host lands that can shelter them from conflicts and persecution and guarantee them a degree of security. Cameroon remains a choice of destination for many refugees and asylum seekers from central Africa and the Great lakes region, in spite of the economic crisis and some socio political tensions linked to the high unemployment rate and cost of living. This position makes Cameroon a new basin of migration based on the geography of violence and wars. In 2008 a total of 4,600 families of about 30,000 people were registered by the UNHCR and they expressed their wish to stay in Cameroon to escape temporarily from unrest in N’Djamena (Spindler, 2008). This is how the Faro Division hosted thousands of refugees from neighbouring Chad. The arrival of these refuges in this division resulted in a number of changes whose consequences are still visible. A question then comes to mind as to how the settlement of Chadian refugees in this area can be considered an explicative variable of economic, socio-cultural and political dynamics in the division (see location map). The choice of the Faro Division is not fortuitous. The settlement of refugees did not take place in all the divisions of the north. Only two divisions received refugees, Benoué and Faro. Nevertheless, no in-depth study has been carried on refugee issues in the Faro Division (Poli-Tapare). My long stay in Poli, the divisional headquarters, is a reason for my choice as I am very familiar with the Poli-Tapare area, which receives Chadian refugees. Source: Base SIG des villes du Cameroun, Laboratoire de Géomatique/université de Ngaoundéré. Adaptation: Baska Toussia, 2011. 2The early eighties were characterised by a massive entry of Chadians into Cameroon in general and the northern region in particular. This massive influx can be accounted for by the blend of many factors including political, military and economic. The sites were not chosen at random. The choice was based on set rules. These migrants who fled from wars generally belonged to various socio-professional categories, including ethnic and religious categories. Before exploring the causes of their migration, it is necessary to trace their origins. Largely assimilated to forced migration affecting countries of the south, the notion of refugees in its modern meaning is relatively recent. Its construction is rooted highly to the Palestinian crisis of 1948 and the signing, three years later, of the Geneva Convention, which regulates the procedures of political asylum and gave birth to the United Nation High Commission for Refugees (UNHCR). 4The present profile of populations in Africa results from a long-lasting process of migration whose sources are deep-rooted in history. Factors provoking migrations are generally centred on crises, be they political, ware-based or ecological. 5From the valley of the Nile up to the region surrounding Lake Chad, the central Africa of the 19th century witnessed many slave raids, which prevailed after the spread of Islam in the region. This led to the displacement of populations whose situation was far better than that of people who suffered the effects of the “Holy War” of the Fulani Jihad in West Africa in the same era (Cordell, 2002: 18). This situation resulted in the displacement of populations in relatively stable zones. They had to handle their security throughout their displacement and resettlement. Ancient migrations are also accounted for by the weakness of agricultural systems. 6In rural African societies, moving from one site to a more or less close site is a compelling solution for those who embark on this venture when basic needs are not fulfilled (poor productivity of land, lack of space or food, to name a few). In contexts of land saturation and demographic pressure, access to resources becomes competitive. In such a situation, migration is the last viable response. As such, part of the population moves from more populated regions to less populated ones. This was the case with the Tupuri people in the 17th century, part of whom had to move from their native soil (South East Chad) to a less populated, woodier region in North-East Cameroon. It was not a global migration that drained all the Tupuri people towards Cameroon but only a part. 7During colonisation, the European administration particularly set up job migrations which where seasonal and intended for cities in a bid to provide manpower. Development migration was aimed at channelling manpower into public works. Guided by the search for profit, colonisers laid more emphasis on the quantitative aspect of manpower to the detriment of quality. The negriers spontaneously preferred to turn to villages instead of cites to look for the human resources that they needed. In this period, 90% of the population lived outside the cities. In far northern Cameroon for example some regions were considered manpower stores. They consisted of non-Muslim populations that were large and hardworking. The exploitation of colonies has always pushed colonisers to encourage the displacement of populations. This can be inferred from what Collette Dubois (2005: 8) upholds. Human mobility can be seasonal: the displacement of “navetanes” (seasonal manpower recruited to harvest groundnuts in Senegal), the migration of Mossi people to the Gold Coast to cultivate cocoa, the recruitment of workers to forest work-sites in Gabon and the recruitment of Khroumen (crew men and dockers) on the coast of western Africa by shipping companies. 8At the dawn of independence, the creation of new industrial units in some places became a sine qua non condition for the development of new states. This entailed a big need for man power as was the case of Mbandjock in the central region of Cameroon. The state organised migrations intended for the agro-industrial company SOSUCAM (Societé Sucrière du Cameroun). Tupuri, Massa and Mundang people were displaced to serve as manpower there. 9As economic constraints of the dawn of independence and political alternation problems kept worsening, population movements diversified in the last decades of the 20th century. 10The situation in Chad worsened progressively before independence on 11 August 1960 resulting in a series of wars and the bankruptcy of the country. Many displacements, including Chadians, resulted from it. The political and economic crises were the immediate causes of departure. They paved the way for a massive forced displacement of migrants. A review of the country's recent political history would undoubtedly make the present work more comprehensive. The creation of the Chad National Liberation Front (Front de Liberation National du Tchad - FROLINAT) in 1966 by Ibrahim Abatcha at Nyala in Sudanese Darfur triggered a series of armed conflicts among various central governments at Ndjamena and armed political movements. There were political, economic and military reasons for these conflicts (Mbaïnaye, 2004: 22). 11In 1962, President Tombalbaye banned opposition parties. Some of his conceited collaborators, especially some members of the armed forces, committed atrocities against the population in the north of the country resulting into the creation of the FROLINAT in 1966 (Ley-Ngardigal, 2008). 12The balkanisation of this movement after the death of its founding father led to the creation of rival wings (Forces Armées du Nord - FAN, Front de Libération du Tchad - FLT...), which took power in February 1979. Soon after, however, given the prevalence of rivalries over the control of power, tribalism and money-mindedness, those rival wings entered into endless, generalised armed conflicts against one another (Ley-Ngardigal, 2008). This further worsened the country's fragile social, political and economic equilibrium. This does not apply to Chad alone. The same happened in a good number of countries in Africa. This is what the Secretary General (Sec. Gen., 1998: 3) once said on the subject to the United Nations’ Security Council. More than thirty years after the independence of African countries, Africans themselves realise the African continent should find the solutions to its problems elsewhere. More than ever before, Africa should examine herself. The major source of conflict in the continent is the nature of the political power in many African countries as well as the real or so-called consequences related to access to power and its confiscation. 13Indeed, instead of contributing to progress this conception of power is a stumbling block and a source of disagreement and social skirmishes wherein the holder of power becomes wary and locks himself among his tribesmen supposedly for protection. Absence of dialogue and mutual wariness between the administration and the population result in non-satisfaction of basic needs. This general problem in the population creates an unstable situation in the state as the people constitute a fertile ground for complaints and revolts. This makes power instable and leads to a situation of perpetual conflict that destroys the economy. We are talking here about the destruction of the traditional economy to be replaced by a sort of “distress economy” where the local population is far from being the beneficiaries. 14War affects the economy and leads to the destruction of infrastructures and the food production system, thus causing under-nutrition, famine and death. This portrays the direct impact that the political scenario has on the population's social and economic conditions. Political quarrels have paved the way for under-nutrition, health problems and a high degree of unemployment. Faced with such a chaotic situation, the most common remaining option is to leave. What matters is the search for asylum and means of survival. As mentioned earlier, the confiscation of power by a tribal minority and political merchandising result in the appropriation of the country's resources, which are then considered private property to the exclusion of the majority of the population. Given that they are excluded from the management of resources, they feel marginalised. This therefore speeds up their quest for greener pastures. In their migration, forced migrants do not follow the same track; they obey certain parameters. 15Before describing the study area that hosts Chadian migrants, it is a good idea to show Cameroon as a haven of peace in a sub region in perpetual unrest. Thus, for decades now, Cameroon has been a land of settlement for many migrants from different countries. It is a kind of receptacle, a melting pot of African traditions. This cultural mix is not originally from Cameroon but instead a general issue in every country due to multiple contacts between people. Some historical facts related to the settlement of foreign migrants can be traced back. 16Between 1966 and 1970, at the peak of the Biafran war in Nigeria, thousands of refugees, especially nomads (Mbororo) and Hausa Muslims settle in Northern Cameroon (Bocquene, 1986: 207). In 1978, Cameroon once again welcomed Equatoguinean refugees escaping the dictatorship of Macias Nguema. This event coincided with a declaration of cooperation between the HCR (High Comission of Refugees) and the government of Cameroon. Between 1980 and 2000, Cameroon welcomed thousands of R. D. Congolese refugees running from Mobutu’ dictatorship. After ethnic clashes in Nigeria in January 2002, close to 20,000 Nigerians settled in the grassland region (Dunga Mantung, Banyo). Between 1979 and 1990, the northern part of the country received more than 100,000 Chadian civilians who fled the war (UNHCR, 1991-2003). Many reasons account for this massive influx of Chadians to northern Cameroon. 17The proximity between Chad and northern Cameroon is the most obvious factor which facilitates displacement at low cost. The short distance made regular access to news from their native Chad easier. The relative superiority of Cameroon in terms of economic development contributed to attract them. 18The climate is Sudano-Guinean, as in the whole province, and has two alternating seasons. Located in the south of the region, the field of study has wet and cooler conditions, with an average annual rainfall of 1,400 mm and an average annual temperature of 25º C, varying between 11ºC in December/January and 37º C in April (Brabant and Humbel, 1974). According to P. Brabant and Givaud (1985) the population density is roughly 10 inhabitants/km2. It is therefore less populated. This also involves the availability of cultivable land. Moreover, northern Cameroon in general and the study area in particular share many linguistic and cultural similarities that facilitate the integration of refugees from southern Chad. Refugees who settle in the Faro area are of various origins. Running away from conflicts or prosecutions, or facing despair, a good number of Chadian migrants have now settled in Cameroon... Some are civil servants, degree holders, unemployed, students, traders, simple farmers... Others are statutory refugees or asylum seekers. Others are ordinary nomads, economic migrants or adventurers from all walks of life (Mbaïnaye, 2004: 22). 20The effects of war gave them all something in common: they are refugees vying for survival. Based on field investigations, refugees members of the armed forces, teachers, health workers and a majority of farmers. According to estimates from informants in the field, Taparé village has received 5,000 Chadian refugees since the beginning of the politico-military crisis in Chad.1 The arrival of so many forced migrants in the Faro area has certainly had multiple consequences. 21The intrusion of new people in a social environment has always been a source of problems. The settlement of Chadians in Taparé has resulted in changes. These changes are felt at the socio-cultural, economic, political and environmental levels. 22The arrival of Chadians at Taparé has ushered in a new type of relationship with the local population. These relationships are most often characterised by an attitude of wariness vis à vis the refugees based on the reasons for the refugees' departure. This wariness and suspicion are further reinforced by lasting stereotypes of Chadians as brutal and cold-blooded. This stigmatisation is seen further in insults like as “dirty Chadians”. In fact, due to the economic situation in Chad, this position is further reinforced, thus presenting Chadians as very poor, living in misery and abject poverty. Given their status as new comers, the displaced are positioned at the bottom of the social ladder. This status of eternal need does not favour a change in attitude toward them. They become more vulnerable. 23The misery in which they live increases their vulnerability, as refugee status is given on the basis of general and not individual conditions in Africa. The 1969 convention of the African Union Organisation, in effect broadens refugee status without necessarily demonstrating that there is individual persecution. This is sign of irresponsibility of western countries vis à vis crises which are not directly related to them (Rodier, 2002: 25). As such, while 80% of refugees were given their status on a collective or prima facie basis, there seems to be a big contrast with Europe, where the majority (if not all) of applicants were given the status of refugees on an individual bases. The HCR (2005: 6) thus holds “regional differences with regard to the recognition of is accounted for by the nature of the existing judiciary frame as well as by the level of economic development(to determine the status of refugees on individual basis is demanding in terms of resources”. These legal provisions contribute to the irregularity of general assistance to refugees. Refugees are abandoned to their own fate and are therefore more vulnerable to HIV/AIDS infection. 24Many factors contributing to the increase in the risk of HIV/AIDS transmission among refugees are quite well known. Refugees are far removed from their native soils. They do not have anything to live on. This institutional and social breakdown has an effect on the cohesion of the community, thus disrupting social sexual norms which underlie behaviours. Being a refugee living far from one's native land can contribute to the consumption of alcohol and drugs, which might result in the destruction of the notion of risk in individual and collective attitudes. In refugee camps women and girls face sexual violence and exploitation. The refugees struggle to satisfy their basic needs for food, water and housing. In these conditions, women and girls often use their charms or beauty for money, food and protection. Children without parental support who are orphans or separated from their families are particularly vulnerable to violence and physical and sexual exploitation (Hankins, et al, 2002). The presence of Chadians at Taparé has increased the population. If pieces of land shared among refugees do not pose problems from the onset, as the population increases, access to land becomes a major concern. 25Migration in northern Cameroon in general is a source of much conflict related to access to land. The most famous disputes are those opposing natives to migrants. Though less visible, intra-family problems are also rife. Conflicts over land are usually triggered by a series of causes. Though the scarcity of land itself is a credible reason for this, this however fails to veil other causes, such as disagreement on the interpretation of previous transactions, the renewal of generations and a rise in money-mindedness (Mahamadou, 2008: 2). 26Old transactions have been considered as definitive by Chadian migrants, while for local populations the land is just lent to migrants. Furthermore, refugees' descendants tend to free themselves from the shackles of verbal agreements on land exploitation, while the offspring of the local population question their parents' agreements. Finally, money-based transactions are also ambiguous. The results are divergences based on the interpretation of agreements. According to the sellers, the lands were simply exchanged for money with refugees for long-term exploitation, which therefore does not free the buyers from traditional obligations.2 For migrants buyers, the plots were bought and should therefore be considered their property and they are thus exempted from all obligations vis à vis the sellers. The seller's behaviour is accounted for by the fact that a plot cannot be definitely sold to a refugee since the he will sooner or later go back to his native country. Problems faced by Chadian refugees with regard to access to land result in a difficult economic insertion. 27The concentration of refugees in camps does not ease their insertion. Survival being the daily leitmotiv, after refugees in Taparé have spent a few years in the area, they start looking for jobs outside their settlement. This situation was worsened by the economic crisis of the late 1980s, which made access to the job market difficult. This is why in most cases these refugees succeeded in finding jobs but as night watchmen at personal residences or in services. This difficult insertion favoured the multiplication of small jobs in the informal sector. This includes cobblers, shoe polishers, water sellers and soya sellers. As one takes a walk in bil-bil quarters in Maroua town, it is easy to note the degree of involvement of Chadian women. They work with local brewers in main quarters where bil-bil is brewed. As such, they are found in Hardé, Fasaw, Domayo Pont called “world market” given the scope of the bil-bil phenomenon. They have ushered in new techniques in the brewing of bil-bil which they fabricate in iron cans. 29Incomes generated from this business have enabled Chadian women to meet the basic needs of their families. The use of millet and corn has influenced the quantity of local annual production. Refugees themselves have thus ended up being involved in agricultural activities. 30Their insertion into agriculture was more successful in spite of the hurdles faced in their quest for plots. The arrival of Chadian migrants at Taparé has boosted the production of cereal, leguminous and oleaginous products. This is visible in the market in the Faro division. Before the arrival of migrants, this unimportant market was not known to the population of the main town in the division. As time went by, the market specialised in selling groundnuts produced mainly by the refugees. The presence of refugees in Faro has political implications. 31After several years at Taparé, refugees and above all their descendants tend to mix with the local populations. The acquisition of national identity cards of their host country constitutes a guarantee of protection and a peaceful living for refugees.4 This is what Mimché (2006b: 60) said with regard to it. For many neighbouring populations, this double nationality consists in concretely looking for official papers (national identity card) of the country of residence in order to escape from prosecution by forces of order and that of the country of residence for eventual visits to the country of origins of family members, to have rights in foreign territories. Moreover, the search for double identity gives refugees some rights in their host country: right to land, access to the job market, and right to education with the same status as natives of the country. 32In so doing, a new identity emerges characterised by dual nationality and the status “new citizens”. The phenomenon of dual nationality and transnationality is an unavoidable reality, given the multiple conflicts that plague Africa This is true for Ivory Coast with the concept of “ivority” as portrayed by Mimché (2006a: 62) in the following excerpt. Today it is difficult to analyse the immigration processes and strategies in the world without considering the development of transnational identities and double identities. The Ivorian crisis and the invention of the concept of “ivority” tells more on this issue which, far from being an implicit form of scientific stigmatisation as mentioned earlier, is a living reality. 33Taking advantage of linguistic and cultural relationships, former refugees will easily mix among northern Cameroon populations and benefit from the same advantages as Cameroonian citizens5. This is the case of Tupuri, Mundang, Massa and Sara refugees who use these linguistic and cultural advantages to integrate into their new society. These integrations reappear in politics as conflicts when these former refugees occupy high positions at state level. 34During Cameroon’s “hot years” at the beginning of the process of democracy, use was made of the presence of refugees in the political field. The 1990s witnessed a wind of democratisation blowing in Africa. Cameroon did not escape from this political gift. This democratisation was marked by many claims, with violence and “ghost towns” paralysing the country. This socio political crisis situation did not force the displacement of the population to other neighbouring countries. But resorting to refugees' votes was an electoral asset for opposition parties or the party in power. Owning official documents was made easy in the perspective of political interests. Refugees constituted an electoral store where political interests were met. The contribution of Taparé refugees has not been just political, as their actions have had impacts at environmental level. 35The arrival of at least 5,000 refugees at Taparé has had many environmental impacts. Given that the presence of refugees has many effects on the environment, environmental problems related to it are major and constant concerns of the HCR. A report from Section Programme and Technical Support (HCR, 1991: 2) outlines three particular conditions of the massive displacement of refugees. 36Refugees are not motivated to protect the environment, due to the trauma of war and displacement and the fact that the land they live on does not belong to them. 39The disappearance of the vegetal cover from a site is caused by the destruction of soils. Soils which are not covered by trees can easily be eroded by rainwater. Research carried out by Long, Cecsarini and Martin (1990: 12) suggests that tree killing caused by the presence of refugees led to massive soil erosion after heavy rains in 1989 “taking away the soils from the treeless areas”. In the long run, this destruction of soils and the killing of trees could have terrible effects on the weather and even agricultural production and thus constitute another cause of displacement. 40The subject of migration movement has hardly been researched in Central Africa, in spite of the plethora of conflicts there. Migration in this area is ancient. Many factors have caused them. Regarding the presence of Chadians in Faro and more precisely in Taparé, the politico-military conflicts in Chad explain this. The choice of the settlement zone was not made haphazardly. Geographical, linguistic and cultural proximities explain why the Tapare area was chosen. This village witnessed the arrival of a considerable number of migrants with diverse socio-professional profiles. This massive presence of Chadian refugees has caused many socio-cultural and economic changes. There have therefore been many conflicts related to land and an increase in production. From political and environmental standpoints, changes include the question of double identity and the disappearance of trees to the extent of threatening the ecological balance. Black, R. (1998) “L’impact des réfugiés sur l’environnement écologique des pays d’accueil (Afrique subsaharienne)”, Autrepart (7): 23-42. Bocquene, H. (1986) Moi un Mbororo. Paris: Karthala. Brabant, P. and F.-X. Humbel (1974) Carte pédologique du Cameroun. Poli, Paris: ORSTOM, notice explicative 107 p, 1 carte 1/200,000. Brabant, P. and M. Gavaud (1985): “Contraintes et attitudes des terres. Provinces du Nord et de l’Extrême Nord. République du Cameroun”. Paris: ORSTOM-MESRES, 24 feuilles 1/750,000, 4 cartes 1/500,000. Cordell, D. (2002) “Des ‘réfugiés’ dans l’Afrique précoloniale? L’exemple de la Centrafrique, 1850-1910”, Politique africaine, 85: 16-28. Dubois, C. (2005) “Quelles politiques de développement pour l’Afrique subsaharienne durant la colonisation?”, Communication réalisée lors des Cinquièmes Rencontres de la Durance, Bamako. Gigla, G. (2009)“Les tenancières des ‘circuits’ et les ‘dada bil bil’ tchadiennes dans la province de l’Extrême-Nord au Cameroun: entre stratégies d’adaptation et construction d’une citoyenneté ‘censitaire’ transfrontalière”, inédit. Hankins, C., et al. (2002) “Transmission and prevention of HIV and sexually transmitted infections in war settings: implications for current and future armed conflict”. AIDS, 16: 2245–2252. HCR (1991) “Some Environmental Considerations in Refugee Camps and Settlements”. Rapport, 10. HCR (2005) Réfugiés: tendances mondiales en 2005. Genève: UNHCR. Ley-Ngardigal, D. (2008) “La crise tchadienne”, Emission radio Afrique Plus, avec Jean-Marie Vianney. Long, L., L. Cecsarini and J. Martin (1990) “The Local Impact of Mozambican Refugees in Malawi, Lilongwe, Malawi”, report to Usaid and the United States Embassy. Mahamadou, Z. (2008) “Foncier et migration", Des fiches pédagogiques pour comprendre, se poser de bonnes questions et agir sur le foncier en Afrique de l’Ouest. l’Agence française de développement, Comité technique "Foncier & développement". Avaliable at: http://www.foncier-developpement.org. Mbaïnaye, B. (2004) “Les Tchadiens du Cameroun: 1ère partie”, Ialtchad Presse. Mimché, H. (2006a) “Circulations migratoires, pratiques sociales et déconstructions des cadres territoriaux autour des frontières camerounaises: trajectoires Nord-Sud”, Actes du 1er symposium international “Stratégies de population et stratégies de développement, convergences ou divergences?”, 24-26 juillet, Dakar, Senegal. Mimché, H. (2006b) “Quand les immigrés se font autochtones. Immigration et dynamique d’appropriation de l’espace des réfugiés tchadiens au Nord Cameroun”, communication présentée au Colloque international “L’asile au Sud. Afrique, Méditerranée…”, 6-8 juin, Ouagadougou. Available at: http://www.ceped.org/cdrom/asile/cd/theme3/03.html [Accessed 18 August 2011]. Rodier, C. (2002) “La construction d’une politique européenne de l’asile entre discours et pratiques”, Hommes et Migrations (septembre-octobre), 1240: 81-93. Available at: http://www.hommes-et-migrations.fr/docannexe/file/1240/1240.pdf. Sec. Gen. (1998) “Les causes des conflits et la promotion d’une paix et d’un développement durables en Afrique”. Secrétaire Général, rapport présenté au Conseil de Sécurité des Nations Unies, 16 avril. Spindler, W. (2008) “Cameroun: De nombreux Tchadiens estiment le retour impossible du fait de l'insécurité”. Points de presse, 26 février 2008 au Palais des Nations à Genève. Available at: http://www.unhcr.fr/4acf41e721.html [Accessed 07 January 2012]. UNHCR (1991-2003) Rapports annuels. Available at: www.unhcr.org/statistics [Accessed 24 August 2011]. 1 Between 1990 and 2002, Chadians returned to their country due to the relative calm that was restored to the area. These arrivals and departures are common whenever there is unrest in Chad. This was the case with the latest upheavals in Chad during which resulted in the town of Kousseri, which shares a border with N’Djamena, receiving thousands of refugees. 2 In the African land tenure beliefs, land is a collective (family, village) not of an individual good. It belongs to ancestors and cannot be sold. Nevertheless, traditional mechanisms permit foreigners to have access to land. Care taking is one of these mechanisms. For the locals, caretaking organises refugees' access to land through money lending. In this way, the seller becomes the “refugee's caretaker” and the buyer has to respect certain local obligations and customs. This is done generally through gifts of part of the harvest to the caretaker and respect for rites at the start and end of the farming season. 3 Bil-bil is a local beverage brewed from millet and consumed in north Cameroon and south Chad. Millet is soaked and conditioned to favour germination. The ground, germinated, dried millet is soaked in large clay pots ready for cooking. After a few hours of cooking, the juice is placed in other clay pots. After this phase, the liquid is left to cool followed by all-night fermentation. By sun rise the fermented liquid from the millet is ready for consumption. 4 Refugees do not acquire national identity cards immediately after their settlement. After several years of continuous settlement in a place, a relational tie is created between the refugees and the local population. The relationship between traditional chiefs and refugees is less suspicious by then. Thus, birth certificates can be issued to refugees easily for a few thousand CFA francs. This document then removes all obstacles to getting an identity card issued as it is the basic document required. 5 The Tupuri and Mundang people are found on both sides of the Cameroon-Chad border. This is as a result of the partitioning of Africa in the Berlin conference in 1884-1885. This divided these people who share not only the same culture but also linguistic roots. Thanks to this link, whether in Cameroon or in Chad, a Toupouri, Moundang or Massa can easily fit into the host localities as he/she does not feel like a foreigner to cultural practices. 6 Several centuries of continuous relations between the people of north Cameroon and their plant environment has favoured the development of indigenous know-how. This knowledge of plant species is seen in every aspect in life. Whether in the socio political, religious or cultural domain, many centuries of coexistence has provided a rich multiplication of traditional knowledge transmitted from generation to generation through rituals and oral tradition. The extinction of these species leads directly to the loss of know-how about plants as the future generations can no longer transmit this indigenous know-how. GORMO, Jean. 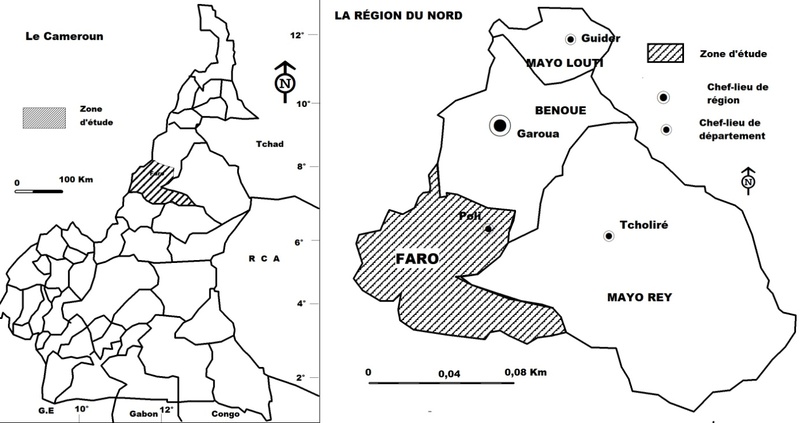 Forced Migration of Chadians in the Faro Division in Northern Cameroon (1980-2010) In : Crossing African Borders : Migration and Mobility [en ligne]. Lisboa : Centro de Estudos Internacionais, 2012 (généré le 20 avril 2019). Disponible sur Internet : <http://books.openedition.org/cei/231>. ISBN : 9789898862488. Gormo, Jean. 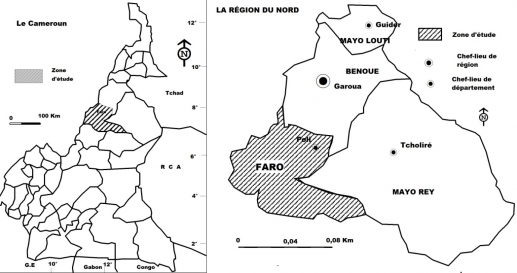 “Forced Migration of Chadians in the Faro Division in Northern Cameroon (1980-2010)”. Udelsmann Rodrigues, Cristina, et Jordi Tomàs. 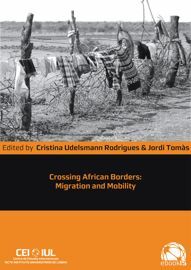 Crossing African Borders : Migration and Mobility. Lisboa : Centro de Estudos Internacionais, 2012. (pp. 71-82) Web. <http://books.openedition.org/cei/231>.